A fading storm brought a mix of weather today. Early AM hours hosted clear skies and what looked like a bluebird day on tap. That soon faded to pea soup as clouds, fog and a light mist moved in mid-day. Bunny Flat was socked in and visibility was poor, however with just a couple thousand feet of elevation gain, one could bust loose from the muck and get up into wide open skies and hot sun. The cloud deck hovered at 8,500 feet for the middle part of the day. By the later afternoon, a partly cloudy sky prevailed with warm spring sun. A few showers blew through at times, but no accumulation occurred. The wind was dead calm and the sun hot. Below treeline, significant drifting could not be found and only a few inches of moist snow rests on top of the old snow surface. Old tracks and portions of the old snowpack poke through the recent new snow. Near and above treeline, slightly more snow (4-8 inches) was measured. Drifts have formed on westerly aspects up to 2 feet deep. Small roller balls were observed on steep, sunny, easterly aspects. I dug a couple pits along the westerly aspect Green Butte Ridge to target newly formed wind slabs from southeasterly winds. While I wasn't able to get any obvious signs of instability to occur, like shooting cracks or cornice triggers along the ridge, I was able to get several moderate, propagating extended column test failures within the new snow. Numerous tests at 9,600 feet /30 degree slope resulted in moderate force, resistant planar, propagating fractures, 8-12 inches down on a layer of well preserved, 2-3mm stellars and plates. These results were easily reproduced, but spatially variable. Some tests resulted in no propagation. Some areas the layer was not present at all. 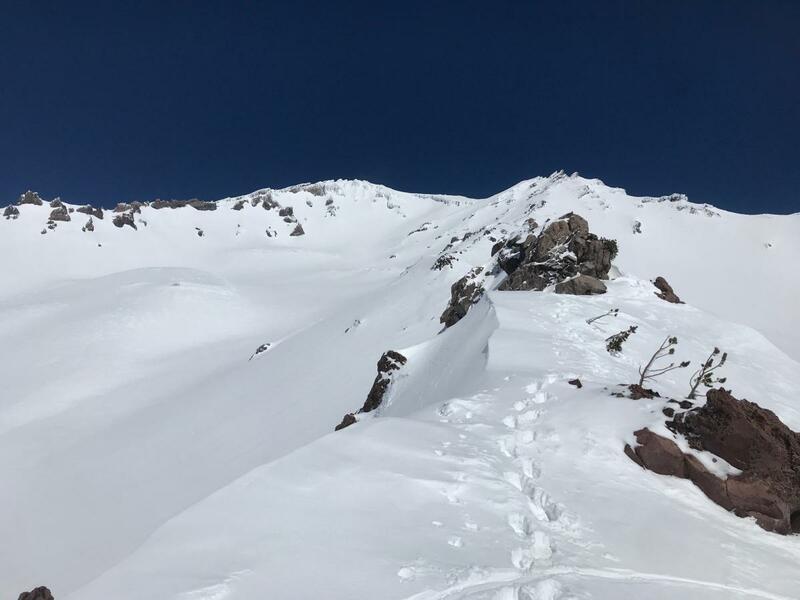 It seems like additional snow load would be required to trigger an avalanche on this layer and by that time, with our warm sun doing it's stabilizing work today, the weak layer will have mended itself. Further, this weak layer seems limited to pockets near ridgelines and is not widespread. Nonetheless, something to consider with additional snow in the forecast this weekend. Overall, snow surfaces are generally smooth. Occasionally, the old, wind affected snow surface can be felt below. The Old Ski Bowl with Green Butte, top left. Minor roller balls were observed on sunny, easterly slopes. Areas of drifting above treeline, drifts up to 2 feet thick on westerly facing features. An extended column test on a wind slab, westerly facing aspect of Green Butte Ridge, 30 degrees slope. Result: ECTP11, resistant planar, 8 inches down. Looking south off Green Butte Ridge, 9,400 feet.